Spool Teacher has been created because the author started sewing at an age she can’t remember (possibly five, when her mother put needle in hand and gave her a few pieces of this and that to attach to each other with thread) and wants to continue her passion in a level as profession, for economy sake, to make a living. She has tried everything else to make herself happy, making a living, to little avail. Everything has lead its way back to fabric as art, creating. She believes there are others who may not have had a mother with the same passion as they, but who have still longed for and dreamed of spooling themselves to achieve dreams of couture or a kitchen apron. Something unique and accomplished. The medium is different, but the process is that of an architect; imagine, design, create. This art form has many manifestations and is only limited by your imagination. 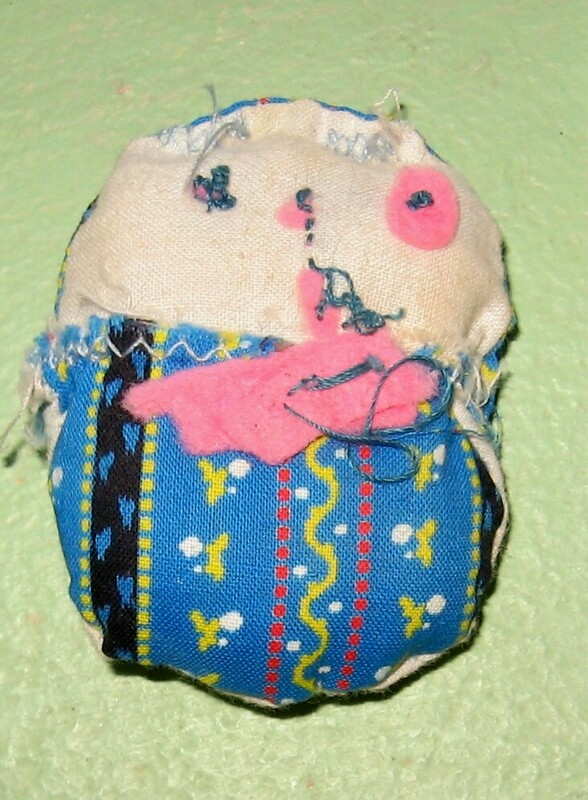 A sewing work of Art at age of about five. Cool Spool! Thanks for helping me pick a purse! So glad you enjoyed the site. Ms. SpoolTeacher has an old White sewing machine her mother gave her when she was 16 and is inspired to do things the hard way whenever she can :o) She, too, has a house full of implements she has collected all of her life sewing and in her career making (having a workroom make) custom window coverings for clients. She did the design work, hired the workroom and was the lucky recipient of any leftover fabric scraps… Today she went to help a friend think about her home remodeling job and came home with a handful of old flowered sheets, one with a border hem that she plans to make curtains from..stay tuned…So glad you’re here.